When you lose a single tooth, we may recommend a dental bridge or possibly even an individual dental implant. However, what happens if you’re missing a majority of your teeth, or all of them? In these situations, we may recommend a full or partial prosthetic. Do you have questions about our dentures? Question: How do you create a full set of dentures? Answer: First, we need to take detailed impressions of your smile. We use the impressions and images gathered to design the prosthetic and fabricate it at a dental lab. The completed denture will have an acrylic base that mimics the appearance of natural tooth enamel, as well as a full row of lifelike teeth. The full denture will be held in place with natural suction, or possibly the assistance of a special adhesive. Question: What are partial dentures? Answer: These replace a handful of teeth, even if they are spread out across an arch. They can handle tooth loss greater than a bridge can, but for patients that don’t yet need a full set of dentures. The prosthetic also has an acrylic base and replacement teeth, as well as metal clasps that attach to the natural teeth, anchoring the new ones firmly in place. Question: How does tooth loss impact overall health? Answer: Without treatment, patients can have difficult eating a variety of foods, which can often deprive them of essential nutrients. Advanced tooth loss can also mean problems communicating clearly. Embarrassment from the gaps in your smile can also lead to issues with your social life. Question: Can you support them with dental implants? Answer: Often, we can support a full prosthetic with multiple dental implants, providing a fixed denture. If you have any questions about our tooth replacement options, then please contact our office today. 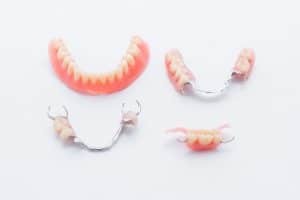 If you’ve lost multiple teeth, then you may benefit from a set of dentures. To learn more, or to schedule a free general dentistry consultation, call Michael Flynn Dentistry in West Allis, WI, today at 414-541-8250. We also proudly serve patients living in West Allis, Brookfield, Wauwatosa, and all Western Milwaukee communities.